Be it Cosmetic Dentistry, Implants or Invisalign, if you need instant dental attention, a 24 hour emergency dentist is your go-to. They not only understand the overall state of your mouth, they also know what changes may be required by your mouth. Additionally, they could make these changes without difficulty, in a safe and effective manner, giving you the healthy mouth you deserve. One of the largest regions of the United States, Texas may be dry, but sure is beautiful and packed to the fullest. A city of the very same region, Killeen has about 137,000 people. Also, it has a handful of urgent care dental centers and dentists that could tend to any emergencies. Once an area of attraction for tens of people for shipping cotton and grains, Killeen was founded in 1881. With at least 40% of the total population being less than 18 years old, the dental care required must be greater than other cities. The likes of dental caries and toothaches seem to be common among kids and youngsters of this generation. A sudden case like this could be handled by 24 hour dentists of Killeen, Texas. While these dentists could handle small dental procedures, they could also provide their patients with dentures, implants and much more. A plus point of emergency dental care centers is that they allow you to rush in, regardless of time and day. A few of these centers operate on weekdays and weekends, allowing patients to come in with ease, whenever they are off work on Saturdays or Sundays. In short, 24 hour dentists and emergency dental care centers make lives much easier. Description When traveling through the Killeen, there are many ways in which a dental emergency could quickly present itself. If you’re having a dental emergency it’s important to get help fast. Call our hotline and we’ll help you find a dentist near you fast! Description: With skilled dentists that strive to help patients get healthy mouths, Aspen Dental is open six days a week, including Monday, Tuesday, Wednesday, Thursday, Friday and Saturday. Famous for fair prices, this dental care center could be contacted via the following number: (254)781-4884. Fillings, denture-related problems and screening for oral cancer are just some of the things that Aspen Dental sees to. Description: Run under the guidance of expert Stephen K. Brandt, the Killeen Pediatric Dentistry is like a miracle for all those child patients who require dental care. Dr. Brandt and his team are friendly and build trust with the patients, slowly guiding them into sitting for dental checkups and other procedures. For an appointment, contact at 254-690-3380. Address: 4102 S Clear Creek Rd #102, Killeen, TX 76549, EE. UU. Address: 4250 Clear Creek Rd #213, Fort Hood, TX 76544, EE. UU. 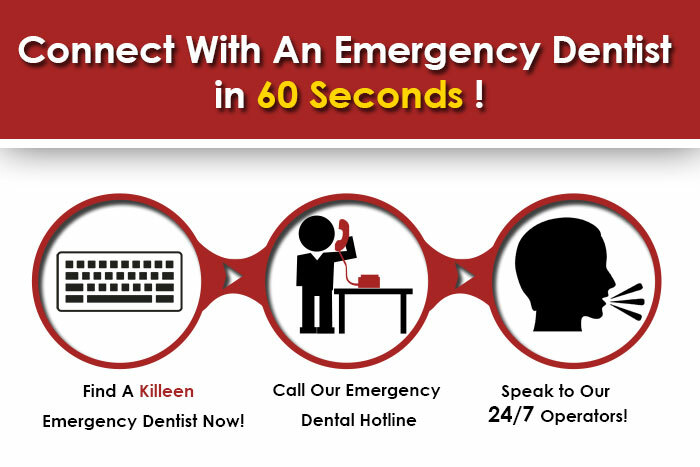 Searching for an emergency dentist in Frisco, TX?